← To be true to my own weirdnesses. The Secret Project Revealed: Telegram Anthology to be Released by Mend My Dress Press! 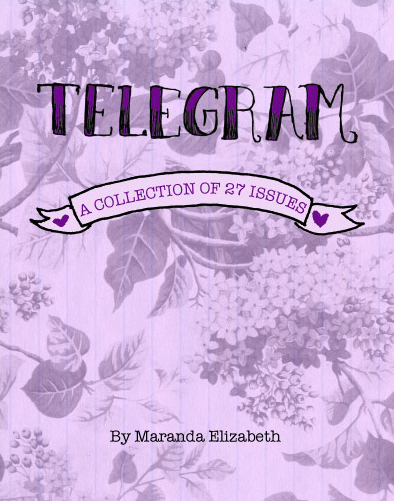 In Telegram: A Collection of 27 Issues, Maranda tells tales of daily adventures, friendship, gender identity, falling in love with bicycles, getting tattoos, moving out, going crazy, and their experiences with inpatient hospitalizations. They also write about their relationship with their twin sister, and learning how to take care of their mental health within and without conventional institutions, identifying as genderqueer, getting sober, living a creative and meaningful daily life, and finding reasons to keep on going. This is the project that has kept me so ludicrously busy over the last few months, that has caused stress and anxiety as I read my past stories, remembered things I had forgotten, and decided which stories to include in the book, and which ones to let fade away. At the same time, it was such an encouraging and magical process, to be reminded of everything and everyone who have kept me alive, content, and sometimes even happy, along the way. I am so excited to finally be able to share this project with you! Colleen and Neelybat have been the dreamiest people to work on my book with, and I am so grateful to them for helping me make this happen! Maranda is a zinester, writer, and daydreamer, and self-identified weirdo and genderqueer. Maranda began writing their zine, Telegram, as a way to connect with others when they were feeling shy and isolated in their hometown of Lindsay, Ontario. They wrote messages of encouragement alongside tales of depression and anxiety, and traded zines through snail mail. With each zine Maranda made, they learned to become more honest and open, began making friends by photocopying thoughts and feelings and confessions, and found that writing and sharing would be crucial to their survival. Maranda especially loves writing about mental health, self-care, and creativity, sending letters to friends and strangers, and sharing ridiculously personal stories. They currently reside in Guelph, Ontario. Release date set for October 2012! Oh my gosh! This entry was posted in Uncategorized and tagged books, know hope, mend my dress press, telegram anthology, writing, zines. Bookmark the permalink.